In a business or academic Word document, you might have many pictures or other illustrations, and you might want to refer to them numerically. 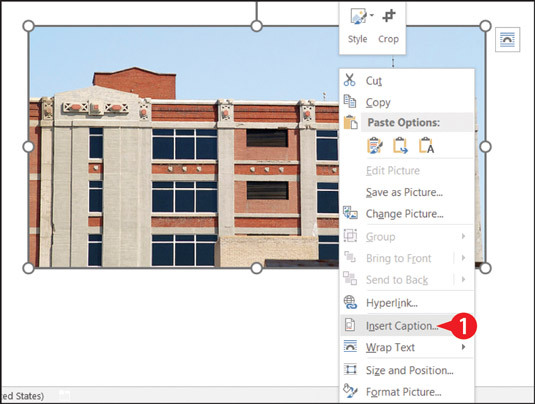 If you use the Caption feature, Word will keep the figure numbers sequential even if you move content around and add or delete content. Right-click the picture and choose Insert Caption. Instead of step 1, you can select the picture and then click the Insert Caption button on the References tab. In the Caption box, after the figure number, type the caption that should appear. If appropriate, open the Label list and choose Equation or Table. Equations, tables, and figures are all numbered separately. You can also click new Label to add another type to the Label list, like Illustration for example. Open the Position list and select a position for the caption if you don’t want the default setting. If you don’t want the word Figure (or Equation, or Table) to appear in the caption, mark the Exclude label from caption check box. For more control over the numbering, such as number format, click the Numbering button. 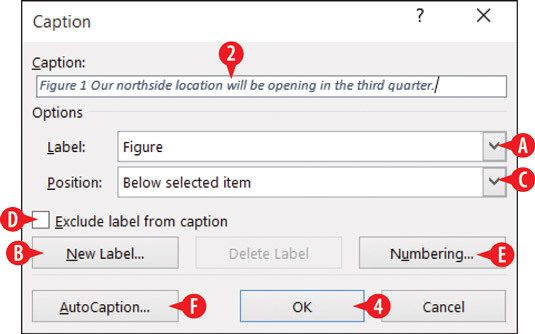 If you want all figures to automatically be captioned, click AutoCaption and then use the AutoCaption dialog box to set up captioning options. Enter the caption to use, and set captioning options. In a technical document, you might want to have a table of figures. That’s like a table of contents except it lists the figures and their captions and tells what page each one is on. To set up a table of figures, use the Insert Table of Figures command on the References tab.